There was a concerted effort in the period following following 26/11 terror attacks alluding to a conspiracy. The buzz was that there was a hidden hand which ensured that the top cops ended up at a single point to be sitting ducks for Pakistani terrorists. Sly allusions were towards Hindu organizations and even IB as perpetrators/enablers of the attack. Sonia dynasty led Congress party’s Digvijay Singh responsible for building party’s muslim base in UP among others has been taking similar lines, engaging with others involved in islamic terrorism. Elements from Pakistan went further and argued that entire attack was an insider’s job. S M Mushrif, former IG, Maharashtra Police asserted something similar in his book “Who Killed Karkare? The real face of terrorism in India”. Former Maharashtra Chief Minister and Congress Member of Parliament Abdul Rehman Antulay with the support of Congress Party General Secretary Digvijay Singh peddled pretty much the same line. As did Pakistan’s ‘expert’ analyst Zaid Hamid. 2. Vijay Salaskar, Ashok Kamte, Hemant Karkare – all were involved in checking organized crime in Mumbai. D Company had ample reasons to target these policemen. 3. The presence of mafia stooges in Mumbai police is known. There is evidence of D Company providing logisitcs support to 26/11 attackers and its nexus with islamic terrorists. What is far more plausible is D Company taking advantage of LeT/ISI’s 26/11 operations, used its stooges to get the policemen at one place and strike at them. Concerted efforts to shift blame on Hindu organizations for attack on policmen by sections of left media and groups that are suspected as over ground faces of islamic terror lend credence to this view point. Ashok Kamte was someone committed to native Indian traditions. He used to perform Pujas including Shastra Puja. 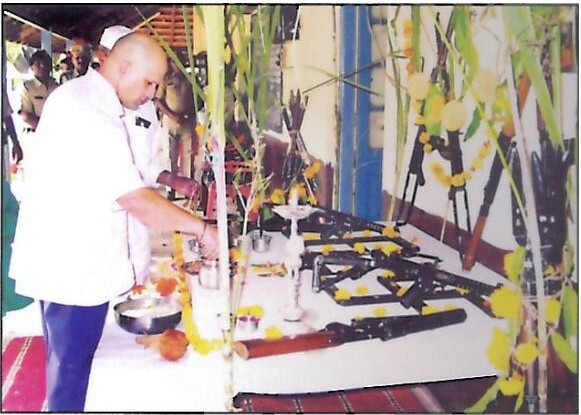 Vijay Salsakar and Hemant Karkare Family members have been attending RSS Functions. One can be fairly certain that the present government, which is a practitioner of vote bank politics and its corrupt big media poodle will not allow real facts on 26/11 to be made public. There is close collaboration financial (Emaar etc.) of Islamic lobbies and the current sickular Indian dispensation. So, facts that Karkare/Salaskar familes were/are sympathetic to RSS, the islamist nature of terror attack will be underplayed/censored in the corrupt big mass media. On account of the unexpected, capture of Fidayeen, Ajmal Kasab, by Hindu Policeman, Tukaram Omble, islami/laal disinformation initiative to palm 26/11 as Saffron Terror has failed. At a time when the bjp is going through its worst existential crisis, the man with the walrus moustache and a mischievous glint in his eyes has become the most sought-after oracle in town. Mohanrao Bhagwat, the 59-year-old boss of the rss, plays the role to perfection, and every word of his continues to be worthy of Page 1 nowadays. The media savvy Bhagwat’s ascension as the head of the House of Saffron has marked a generational as well as cultural shift in the organisation. He is the moderniser, the 21st century face of the rss. As the bjp seems to have abandoned its core ideology for the sake of coalition politics, Bhagwat has brought Hindutva back to the national agenda. As the bjp suffers from the absence of a leader who can take the party out of the wreckage of defeat, the sixth sarsanghchalak has become the supreme guide and the wise counsellor. As the party retreats from the national mindspace, he styles himself as the last apostle of the nationalist cause. As its ambitious but discredited leaders struggle for the spoils of a lost war, he tells them: behave or be damned. Still, the Brahmin bachelor from Chandrapur in Maharashtra finds time to read the new Dan Brown. Like the symbologist hero in The Lost Symbol, Bhagwat too has to think smart and act fast to save the Parivar he heads. In a candid conversation with Editor prabhu chawla for the Seedhi Baat show on Aaj Tak channel at the rss office in Jhandewalan in Delhi, Bhagwat talks about subjects ranging from the future leadership of the bjp to Vande Mataram, from Chidambaram to Modi, from Pakistan to China—and more. Excerpts. Q. What do you think about the Deoband reaction against Vande Mataram? A. Vande Mataram is for all Indians. It was part of our freedom movement and history. There was a time when both Hindus and Muslims sang it. Q. The Muslims say it is against their religion. A. I don’t think any religion is against desh bhakti. To say Bharat Mata ki Jai and Vande Mataram is not like a religious puja or idol worship. Q. What is the Sangh’s view? A. (Thumps the table) Vande Mataram kehna hoga (Everyone in India will have to say Vande Mataram). Q. Do you think the minorities felt threatened after the Masjid fell? A. I would say that the wishes of the Hindu samaj were ignored by the government. The anger against the system was taken out on the structure. Q. But your strong take on the Babri Masjid, the Uniform Civil Code and Article 370 makes minorities insecure. A. Just tell me why is there no rational dialogue regarding such matters. For 90 years there has been no court judgement (on the Ram Mandir). And when nothing happens, the average man loses his balance. Q. V.P. Singh had a formula to build both mandir and masjid at Ayodhya. As a responsible organisation why don’t you show some magnanimity? A. This will not create unity. If a Ram Mandir is built peacefully, it will end Hindu-Muslim fighting. A mosque can’t be constructed at the same site. Let them construct another mosque at some other place and the Hindus will extend all possible help. Q. The Congress apologised for the anti-Sikh riots and Advani said the demolition was a national shame. A. The Sangh did not say “demolish the structure” but the court’s delay on the verdict angered the people. Q. Do you agree with Advani that it was a national shame? A. I don’t agree with Advani on this issue. Why didn’t they give legal permission for kar seva when so many people had collected for it? Q. Why is the Sangh unwilling to do something which makes minorities feel safe? Whatever happened in Gujarat also added to the gap between the Sangh and the minorities. A. Violence is wrong wherever it happens. Don’t just look at one side. What happened in Godhra should not have happened. No one talks about the killings at Godhra. Q. Should Narendra Modi apologise for the Gujarat carnage? A. He is the head of a state, he has full knowledge of what happened and is capable of giving his reaction. If he thinks that something that needs an apology has taken place, then he will apologise. I am sure. I have also been told the speed with which the riots in Gujarat were controlled is commendable. Why should he apologise if he has done no wrong? That is not the way. Q. Sonia Gandhi and Manmohan Singh were not responsible for the 1984 riots but have apologised. It increases their stature. If Modi or the rss do the same, they will stand to gain. A. At that time there was a comment, ‘When a big tree falls, some things are bound to happen.’ No such statement was made in Gujarat. Q. Does it mean the rss will never compromise on its core issues? A. India’s unity and integrity is non-negotiable. So is the Ram Mandir at Ayodhya and a Uniform Civil Code. Q. If I understand correctly, you still believe in Akhand Bharat and not in the two-nation theory. A. It is all part of India. Pakistan is transitory and will become part of India sooner or later. A. Pakistan and Afghanistan are a part of us and will return one day. Q. You claim that the rss has no direct control over the bjp. But it sent 35 pracharaks to the bjp and they report to you. A. It is not compulsory that they report to us. We only want them to stick to their principles. We don’t interfere in their work. Q. There have been reports of rss pressure on the bjp, that Vasundhara Raje was removed because of pressure from the rss. A. The rss had nothing to do with it. This is an internal matter of the bjp. Q. Four months ago you talked about a change in the bjp leadership. The bjp lost three state elections and no change seems forthcoming. A. Change will happen but at its own time. I only said what I have been told (by the bjp), they have a plan in mind and it is rolling on. Q. There is a strong feeling that the rss is intervening and imposing itself on the bjp. A. The rss never intervenes, only gives advice when asked. Q. But you have said that the new leadership will be someone other than these four (Sushma Swaraj, Arun Jaitley, Venkaiah Naidu and Ananth Kumar). A. Yes the new leadership will be someone other than these four. This is what I have been told. That is what has been agreed on and I believe the process has begun. Q. You will get someone from outside Delhi between 50 and 55 years of age? A. They will get someone from outside Delhi. Q. In the last five-six years, several people who are media creations with no affiliation to the Sangh have come into prominence in the bjp. Has this lead to a dilution in ideology? A. The Sangh is not against anyone, we don’t look at anyone whether he is a swayamsevak or not. Q. Are you worried about an image of corruption amongst the swayamsevaks who have joined the bjp? A. Politics is a slippery ground but still we don’t want to see one of our swayamsevaks slipping. We talk to them but it is up to the bjp to take action against them. Q. The bjp is a visible face of the Sangh Parivar. Are you worried when you send workers to the party? They also get affected by the personality cult and the individual becomes more important than the organisation. A. Yes we are worried and we do talk to them about it. Q. Would you prefer that the party is led by someone who believes in the rss ideology? A. Who will lead the party is something they will decide. What we want is someone who articulates our ideology, believes in teamwork, encourages the younger generation and the difference in ‘a party with a difference’ should be visible to all. Q. There are some outfits that are not part of the Sangh, yet there is a perception that they belong—like the Sri Ram Sene of Karnataka… Pragya Thakur. Why don’t you disassociate the rss from them? A. I have already said that I have nothing to do with the Sri Ram Sene. There is no such thing as Hindu terrorism. No Hindu will support terrorism. Q. Yet you supported Pragya Thakur. A. No, all we said is that don’t do a media trial. Let the courts decide. Q. I saw a recent statement by the Sangh saying that P. Chidambaram is doing good work. A. He is saying a lot of good things, but if he delivers on these, we will definitely praise him. Q. Are we soft on China? A. I have my doubts if the Government is alert on China. It has a well-defined strategy of encircling India. China has surrounded us by wooing our neighbouring countries from Maldives to Pakistan. We have to liberate our neighbours from the clutches of China. Q. Have the Chinese defeated us at diplomacy? A. Overtaken, not defeated. We can still do something. Q. Regarding Pakistan, the bjp seems confused. What is the rss view? A. Pakistan exists on the premise of being anti-India. Pakistan needs to be given a decisive reply for all its mischievous actions, we need another military victory over Pakistan. That is perhaps the only way by which we can prevent a 26/11 and terror attacks. Q. Have we lost an opportunity to score a military victory? A. When Parliament was attacked and then after 26/11. Our government failed us then. We lacked the will. Q. Do you agree that a strong and stable Pakistan is good for India? A. If Pakistan is mentally healthy and gives up anti-India sentiments only then it’s good for India. BJP: Vasu Cut Down – Is Kamaraj Type Plan the Way Out? Perceptions over a period of time shape credibilty and credibility is an important ingredient in electoral market place. The way in which Vasu’s resignation was played out shows that either or both LKA/MB are making serious errors of judgement. their hands off from these happenings as they unfold. standards. Vasu/Gen Khanduri might have failed to deliver. But so did Arun Jaitley(AJ)/Raj Nath Singh(RNS) in UP. first. The argument that RNS is anyway on the way out is specious. manifest in BJP’s transition, reflects serious mistakes that BJP/RSS leadership is making. if allowed to drift can impact credibility of Sangh. BJP/RSS is showing poor understanding of how perceptions are formed, credibility built. Perceptions are important in democratic polity. BJP should know that it is operating in a hostile environment where its positive points will be under reported and its weaknesses amplified. Perceptions over a period of time shape credibilty and credibility is a key ingredient in electoral market place. But for backing from LKA/MB, it seems unlikely that adhoc and arbitrary decisions’ll be continuously taken. Sangh cant wash its hands off from the events as they unfold. It appears Mohan Bhagwat’s message on transition is being undermined. Despite Vasu’s mistakes, it is not untrue that the likes of Jaswant Singh undermined Vasu during her tenure. Vasu’s accusations are a mere paraphrasing of what Arun Shourie highlighted in an even more damning terms – existence of double standards. Vasu/Gen Khanduri might have failed to deliver. But so did Arun Jaitley(AJ)/Raj Nath Singh(RNS) in UP. While failure in itself should not be a disqualification, as failures often result in learning key lessons, repeated failures, is a disqualification. From this perspective, Raj Nath Singh much more than Vasu/Khanduri should have been asked to resign first. The argument that RNS is anyway on the way out is specious. Buck rests at the top. Bleed an enemy by thousand cuts is something delivered on hostile elements. Not on oneself. Protracted bleeding that is being manifest in BJP’s transition, and they reflect serious mistakes that BJP/RSS leadership appear to be making. When drastic changes to the organization are being carried out, it is better if it is done fast as a surgical strike. If there is a bloodbath, so be it. Such a course is better than protracted bleeding (factional shenanigans) that will impact BJP perception in the minds of its prospective voter base. A rapid strike also helps set the rules of the game – cut down factionalism. Events if allowed to drift can impact credibility of Sangh. One way to effect quick transition is through BJP’s own version of Kamaraj Plan. BJP can of course can call it “Vajpayee Plan” or “Advani Plan”. More than semantics what is important is person/team arbitrating the plan execution should be competent and perceived by most sections as genuinely neutral. People holding central party leadership positions, should be asked to quit. Let redeployments be representative, based primarily on capabilities/performance rather than solely on loyalty/Sangh legacy. While importance of loyalty/trust cant be underplayed, deployments should be based primarily on potential for showing, sustaining positive results. Tailpiece: Post this blogpost, Sarsangchalak of RSS, Shri MB openly alluded to serious nature of BJP’s problems. Contrary to inspired media leaks, central problem seems to lie with the BJP top brass. Coherent definition of Ideology elements such as Hindutva, Big Ideas that will have resonance in minds of voters. Social Engineering to expand its voter base on social and economic criteria. Execution done by enabling the Organization machinary, effectively synergising with like minded organization/groups/opinion makers. A committed dharmic battle fought in the mindspace, resolutely over a period of time is the way to go. There should be a will to win backed by killer instinct (Krishna Neethi) to win. Perseverence will be the key. While the election campaign is culmination of the fight, the war to root out totalitarian dynastic evil congress I (islami-isai) is continuous and it should continue with full vigor. Rogue professor Ram Punyani is back with his Goebellsian lies and shibboleths fittingly this time in Muslim India. Punyani cites what he calls Hindu mal-treatment of women. Censors the fact that in native Hinduism alone feminine as divine is accepted and celebrated, so unlike islam. It is indeed laughable that Punyani’s vehicle for feminst stand is an islamic medium. In every sense Hindu women in India are better empowered than islamic women. Punyani pretends as if in islam, Talibs alone are anti-women. Typical of leftist deceit, he censors islam’s position on women: quran/mohummad institutionalized inferior status of women. Quran, Verse 4:34 howsoever muslims spin it, is quite categorical on this count. Watch the video below for elaboration on quran’s position on status of woman – property of man, fit to be beaten up. Native Indian beliefs are essentially non dogmatic. Manu Smriti hardly has the dogmatic perception Hindu’s mind unlike the position koran has in a common muslim’s. 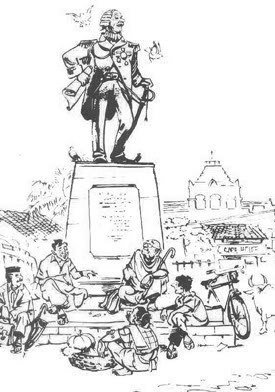 Punyani of course tries to do better than Don Quixote. He regurgates the nonsense on slavery of Shudras. He surely cant be ignorant of the historical fact that Shudras like Shivaji, Narendrabhai Modi, Sanghi have been in the fore front defending native Indians and their traditions. And the so called upper caste Hindus never have any problem being led by Shudra leaders like NaMo, Shivraj Chauhan. Contrast this with institutionalised tribal heirarchies and approval of tribal incompatibility as valid reason for divorce in islamic law – shariah. Islamic equality indeed! Far from equality, Inequality is institutionalised in islam. With their chosen red fundamentalist friends like Ram Punyani, muslim Indians dont need enemies. After working to undermine native Indians, their beliefs, their unity, muslim victimhood cries will be hollow, if their actions similar to the ones in Godhra, result in hostile native responses. Muslim hypocritical cries will be rejected with the disdain with which native Indian Gujaratis have been rejecting them. Rashtriya Sevika Samiti is an autonomous organisation with a separate charter which includes inculcating leadership in women. Sangh does not micromanage it. Unlike muslims and communists, Sanghis worship Indian Nation as a Feminine Manifestation, Bharat Mata. Sangh Recently awarded Guruji Award to Ms Kom, India’s boxing champion.